What Sectors are Best for a Dividend Portfolio? One of the best ways to build a sustainable income stream is to invest in quality dividend stocks. 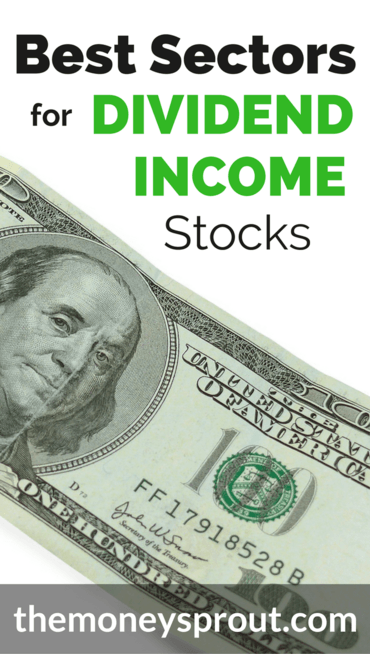 For (almost) the past decade, my wife and I have been building our dividend income portfolio. This portfolio of stocks continues to grow each and every year … and will earn close to ,400 this year alone in dividends! The good thing is that each of the stocks that we own are unique in their own way and help to make our portfolio diversified. The key to building a portfolio of dividend stocks … is to screen for certain characteristics. For example, we look at P/E ratio, payout ratio, current yield, and dividend growth rate before buying a stock. Another thing we consider when purchasing a dividend stock is what sector it comes from. There are companies that pay dividends across every sector. Which often brings up the question – What sectors are best for a dividend portfolio? While certain sectors may have more companies to pick from that pay a dividend, it doesn’t necessarily mean one is better than another. So in order to figure out the best sectors for building a dividend portfolio … I wanted to share a breakdown of our portfolio and the sectors our stocks come from. Overall, we currently own 32 stocks in our dividend growth portfolio – The Money Sprout Index. These companies come from 9 different sectors + Real Estate Income Trusts (REIT’s) and account for over $2,000 per year in income. The average current yield is 3.07% from these stocks combined and our yield on cost is 4.48%. We truly believe in the power of building a diversified portfolio that covers many companies, across several industry sectors. Here is a snapshot of sectors where we own shares of stock. We currently own 6 dividend stocks found in the Consumer Discretionary sector. Stocks from this sector earn $297.52 in annual dividend income for us. At the time of this writing, we are actively buying shares of Best Buy (BBY), Target (TGT), and VF Corp. (VFC) from this sector. All of these shares are being purchased through monthly investment plans in our LOYAL3 account. The Consumer Staples sector is our largest group of stocks that we own. It currently earns us $434.05 in annual dividend income. While the Consumer Staples sector accounts for the most income in our portfolio, we are only actively buying shares of Dr. Pepper Snapple (DPS) from our LOYAL3 account. We are also periodically investing in Archer Daniels Midland (ADM) when funds allow in our Robinhood account. A few years back, we owned shares of ConocoPhillips (COP) … which is in the Energy sector. But due to a dividend cut … we immediately sold our shares in the company. That leaves us with Exxon Mobile as our only holding from this sector. This stock has been very good to us and currently pays us over $100 per year in dividend income! Despite only owning one company in the Health Care sector … it is a biggie – Johnson & Johnson (JNJ). Personally … I believe this is one of the best dividend stocks you can own. While we are not actively buying shares of JNJ (other than from DRiP) … we plan to start allocating new money towards buying shares in this company. Back before the financial crisis (2007 & 2008), the banking industry had some of the most popular dividend paying stocks. Many companies who had been raising dividends year after year were forced to make cuts. There are still some top notch companies that weathered the storm. We own two different companies in the Financials sector and are actively buying shares in one of them – Cincinnati Financial (CINF). In addition, we add to our current shares in Aflac (AFL) when funds allow. Many stocks from the Industrials sector took a nose dive a few years ago but have recently come back. There are four different companies that we own shares in from this sector, but none that we are actively investing in. After many quarters of zero dividend growth, Norfolk Southern (NSC) finally raised their dividend. Caterpillar (CAT) and Emerson Electric (EMR) continue to tread water. The real bright spot for us in this sector is Lockheed Martin (LMT). This company is our highest earning stock (as far as dollar amount), bringing in $211.43 in dividend income per year. A few years back, we didn’t own too many shares in the Information Technology sector … only a few shares in Intel (INTC). Now the Information Technology sector is one of our fastest growing group of stocks. The yields are generally not as high as other sectors, but the dividend growth rates seem to be much better in comparison. Without question, you will find the highest yielding dividend stocks from Real Estate Income Trusts. These companies are setup to payout the majority of their earnings as dividends. We have a sizeable amount invested in two different REITs … which helps us bump our overall yield up. I don’t recommend investing everything just in REITs … but they can be a nice addition to a diversified portfolio. There is only one stock from the Telecommunications sector that we own – Verizon Wireless (VZ). We initially invested in this company for it’s higher yield … but have not been actively buying any shares. The dividend growth rate (DGR) is very low for this stock, which makes it difficult to add new shares. While we only own a single stock from the Utilities sector, it is a very important one. Consolidated Edison was the first dividend stock we ever purchased over 8 years ago. We are not actively buying shares, but are adding to our position through DRiP. Our yield on cost is an awesome 10.5% from this company! Note – We currently do not own any stocks in the Materials sector. At one point we owned shares of BHP Billinton (BHP) but sold our position when they made a dividend cut. I don’t necessarily think there is one sector that is better than any other when it comes to finding quality dividend stocks. New investors just starting to build their portfolio will likely find great opportunities in the Consumer Staples and Consumer Discretionary sectors. These two sectors include many well known traditional dividend paying companies that have been around forever it seems like. On the flip side, there are not many options in the Materials or even Utilities sector. A few stocks, but not too many. You may also want to consider including a small percentage of your portfolio from Real Estate Income Trusts and Telecommunications to bump up your current yield. Many companies from these sectors offer high yielding opportunities, but generally don’t have much growth. On the other hand … adding Information Technology companies may be a way to give your portfolio a balance of high dividend growth. And don’t forget the Energy, Health Care, and Financials sectors in your portfolio. At one time these three sectors had plenty of awesome dividend paying companies. While not as many nowadays … there are still some great opportunities (i.e. JNJ, XOM, and AFL). Lastly, don’t count out stocks in the Industrials sector. Our highest dividend income earning stock (LMT) comes from this sector. As you can probably tell … there isn’t just one or two sectors you should be focusing on to build a dividend income portfolio. You should consider multiple companies from many different sectors in order to diversify your investments. 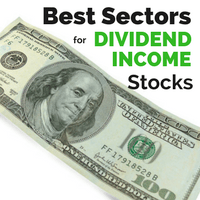 What sectors do you prefer to invest in for dividend stocks? Are there any that you avoid? Full Disclosure – At the time of this writing, we owned shares in the following stocks noted in this post – AAPL, ADM, AFL, BBY, CAT, CINF, CLX, CSCO, DPS, ED, EMR, GPC, INTC, JNJ, K, KO, KHC, LMT, LOW, MCD, MSFT, NSC, O, OHI, PG, SYY, TGT, UL, VFC, VZ, WMT, and XOM. The material above is not a recommendation to buy. Please do your own research on a company before deciding to invest.